that warn of impending chastisements? I’m often asked for my opinion about modern-day mystics, inner-locutionaries and visionaries, i.e., people who claim to be getting messages from Jesus or Mary. The questions come especially about the ones who warn that Americans are soon going to pay for their sinfulness, or that the anti-Christ is here or is coming soon, or that time is short and disaster is looming for the entire society or world. 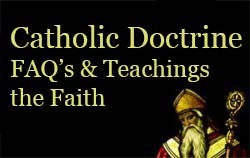 My answer comes not from any supernatural, direct revelations, but from the Catechism of the Catholic Church, study of scripture (all of it, understood as a whole, instead of pulling phrases and quotes out of context), Pope Saint John Paul the Great, psychology, sociology, and the historical view of the Church and of society. I cannot tell you what to believe — there are no official Church documents that deal specifically with these modern-day messages. The Church Magisterium only states that our salvation does not depend on new revelations but only on the revelation of Christ 2000 years ago. The Church officially warns that any message that contradicts scripture is to be disbelieved, and that even when a visionary or inner-locutionary reveals messages that are completely orthodox theologically, this by itself is not proof of a supernatural event. When the Church investigates a case, the only time it can come to a definitive conclusion is where the messages contradict scripture and orthodox dogma. If there seems to be no contradiction, the investigators delay giving official approval until after the messages cease (which is usually after the person receiving the messages has died), as a precaution. What if after giving approval the messages were to change and begin to preach errors? If you ask me what to believe about modern day revelations, all I can tell you is what makes sense to me. My answer comes from more than 40 years of observation and prayer and study and relying on the Holy Spirit to correct my faulty, imperfect, limited understanding. I’ve been thinking about this since I first heard, as a child in a Protestant denomination, that a church group was waiting on a hillside for the Second Coming of Christ, which they were certain was about to occur. In my personal relationship with Christ, I’ve developed a policy of distrusting any “messages” that are full of doom and gloom and warnings about chastisements for society-wide sins. The Jesus who walks with me every day focuses much more on building up what is good, even in unrepentant sinners, just as he did 2000 years ago. He invites repentance through compassion and reaching out to sinners in love, healing, and teachings on the holy way of life. The only harsh words he spoke were against unteachable Pharisees, and he never said more than a few words in that line. More people are converted by words of encouragement than by threats of punishment. It’s a 1st Vatican Council era mentality that tries to get people to heaven by threatening them with hell. In the Vatican II era, we’re paying the costly price of the threat-method, as many young people wander away from the Church. Most older Catholics, who were born and raised in the Catholic faith, don’t understand evangelization. Most parishes and their religious education programs fail to reach out to or attract the wanderers back to church. When private revelations sound more like threats than evangelization, I tend to suspect that their origins are more human than divine. Consider the psychological factors that might be the cause of doom and gloom messages “from Jesus”: There’s a certain amount of comfort in them. Many people are so frustrated with societal evils that they want Jesus to come back very soon and punish the evil-doers. Unconsciously, messages from Jesus or Mary warning about chastisements could be a wish for revenge and/or for personal protection. We’re a lot closer to the fulfillment of this mission, more than at any other time in history, thanks to internet communication and the new springtime of evangelization that Saint John Paul the Great initiated. To move forward, as a body, we have to become unified in loving the evil-doers, reaching out to them rather than hating them and wishing that Jesus would hurry up and punish them. I suspect that when the Body of Christ globally gets crucified and resurrected, our ascension will occur at the time of the Second Coming of Christ as his earthly Body is glorified. Before this can happen, the broken and divided Body of Christ has to become healed and unified. We read again and again in the book of the Acts of the Apostles that many people were converted by the love they saw in the Christian community. I believe that the sign of the Second Coming to look for is not the evil that exists in the world, nor an appearance of Jesus descending from heaven, but the growth of unity between Catholics and Protestants and a global outreach of love that springs forth from that unity. Then, evangelization will become so much more effective that the number of souls that are saved will be much more pleasing to God. Evil will be defeated by our unifying love and our outreach of love. Isn’t this much more truly the way of Christ than what many private revelations are warning will happen? Isn’t this more like Christ than making evil-doers pay for their sinfulness through disasters and the coming of the anti-Christ, as described in many of the warnings of private revelations?